Proper maintenance maximizes your trencher’s efficiency. 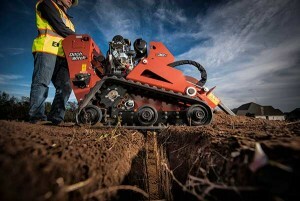 The process of digging a trench takes a significant toll on a trencher’s digging system, or its chain, teeth and sprockets, said Chapman Hancock, Ditch Witch product manager of CTS, service parts and telematics. So, this area requires a little extra TLC. “These components are the core of the trencher,” Hancock said. “If you operate when they are worn down or otherwise damaged, more horsepower will be used and put more strain on the machine as a whole. Proper maintenance can reduce downtime in the field, extend the life of your equipment and ensure you get the most bang for your buck. Here are a few tips to maintaining a trencher’s digging system. 1. Match the teeth and pitch to the soil type. Matching the components of the digging system to the soil conditions allows you to get the most efficient cut, Hancock said. Combination—combines cup teeth and carbide for mixed-soil conditions. Two-pitch chains—have a tooth on every station of the chain and have more teeth and more surface area for cutting, making them most effective for dry soils and rocky conditions. Four-pitch chains—have a tooth on every other station and have more space between teeth, helping them cut smoothly through muddy, wet soils. 2. Maintain the proper chain tension. The tension of your chain plays an important role in how the machine as a whole operates, said Hancock. Following the tension specified in the operator’s manual can help prevent lost time and productivity. Loose chains will slap the top and bottom of the boom and can bind up in the tail roller. Both create unnecessary wear and tear on multiple components of the trencher. Tight chains place unwanted strain on rollers, booms and sprockets, causing components to break or wear out faster than they should. The trencher also will use excessive horsepower and create additional strain on the operator. 3. Replace individual components when necessary. The chain, teeth and sprockets are interdependent; if one component isn’t functioning properly, it impacts the performance of the others and of the entire machine. Checking them daily, or at the end of each job, will alert you to any maintenance needs before they become issues. Threadbare chains not only damage teeth and sprockets but can generate shock loads that impact major components of the trencher. Dull, worn or broken teeth should be replaced immediately. You don’t want a small number of new teeth doing the majority of the work—it will be less productive and they’ll wear out even faster. This is especially true for carbide teeth. Worn-down sprockets tend to come with worn-down teeth and/or chains. In particular, if you are replacing the chain, it’s always best to replace sprockets at the same time. Running new chain on old sprockets can cause chain failure, and old chain running on new sprockets will cause premature sprocket wear. Be sure they match up properly to ensure the longest life. Incorporating regular maintenance and upkeep into your routine is well worth the time, according to Hancock. When your digging system is operating properly, you get optimal performance, reduce downtime and improve your bottom line.